Temperatures have dipped into the teens, and ice is forming on ponds. Yes, we’re finally feeling cold. What we’re feeling, though, is nothing like what folks used to feel. 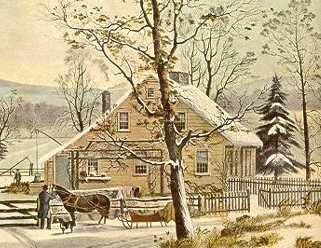 The people who settled New England experienced cold as you would never want to. In January and February, frigid air was a 24/7 phenomenon inside most houses, which were inefficiently heated and poorly insulated. 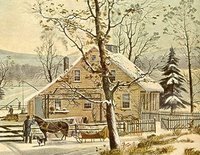 Until the arrival of central heating in the late 19th Century, houses were often iceboxes in winter. It was not unusual to have the water in the house turn to ice overnight and to have snow leak through windows and stay frozen on the floor. Frostbite was a problem not only outside, but indoors, where bedroom temperatures could approach zero. And let’s not even think of what outhouses were like. So as your nose and fingers tingle and your breath freezes in front of you when you leave your well-heated home, take a moment to remember those hardy people who came before us and who knew few comforts at this time of year.